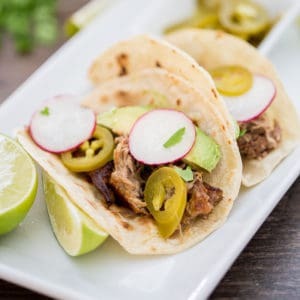 Instant Pot Carnitas are here! One of my favorite things I’m discovering about the Instant Pot is its ability to quickly cook carnitas, roasts, and other dishes made with tougher and cheaper cuts of meats, and turn them into succulent main dishes. This is not the first time I’ve posted a carnitas recipe on the blog. My Slow Cooker Carnitas have been wildly popular, but they are definitely on the other end of the cooking time spectrum ( like EIGHT HOURS! )! My favorite thing to do with crispy carnitas fresh from under the broiler is to make pork carnitas tacos. I haven’t really ever met a taco I didn’t love, but carnitas tacos are my FAV – particularly with a little fresh radish, avocado, and drizzle of hot sauce! 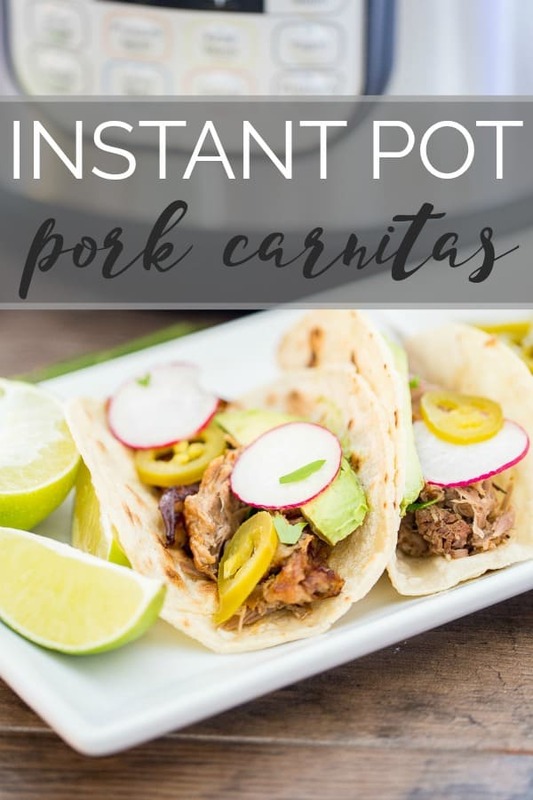 I promise all of my Instant Pot recipes won’t be Mexican themed, but I wanted to start with these first two ( this Instant Pot Carnitas recipe plus my Instant Pot Black Beans recipe ), so you could see how you can make almost an entire meal with your Instant Pot! 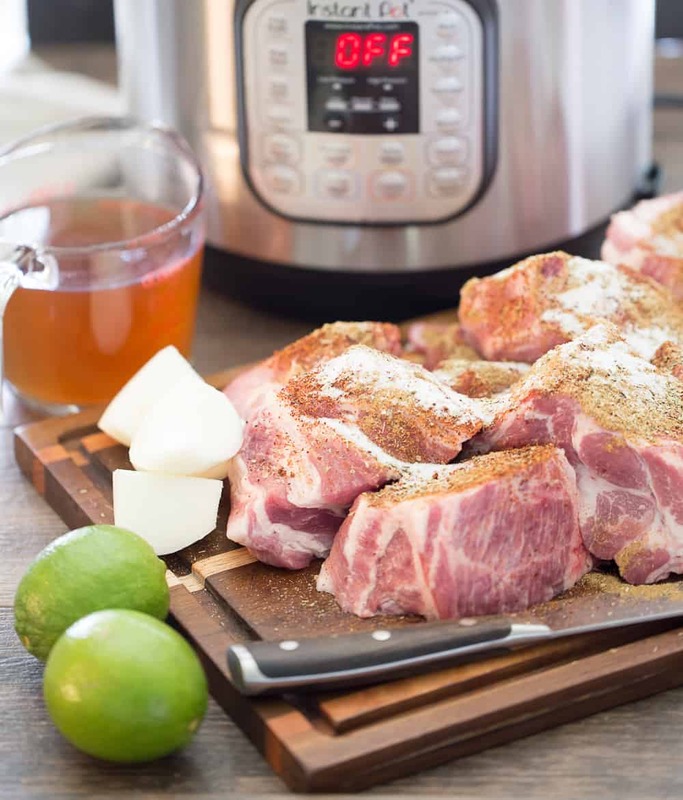 Instant Pot Carnitas are so easy to make - you'll feel like it's cheating when you taste how good they are. 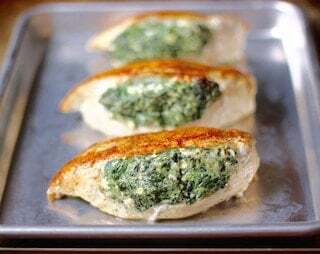 Get them super crispy by broiling right before serving. 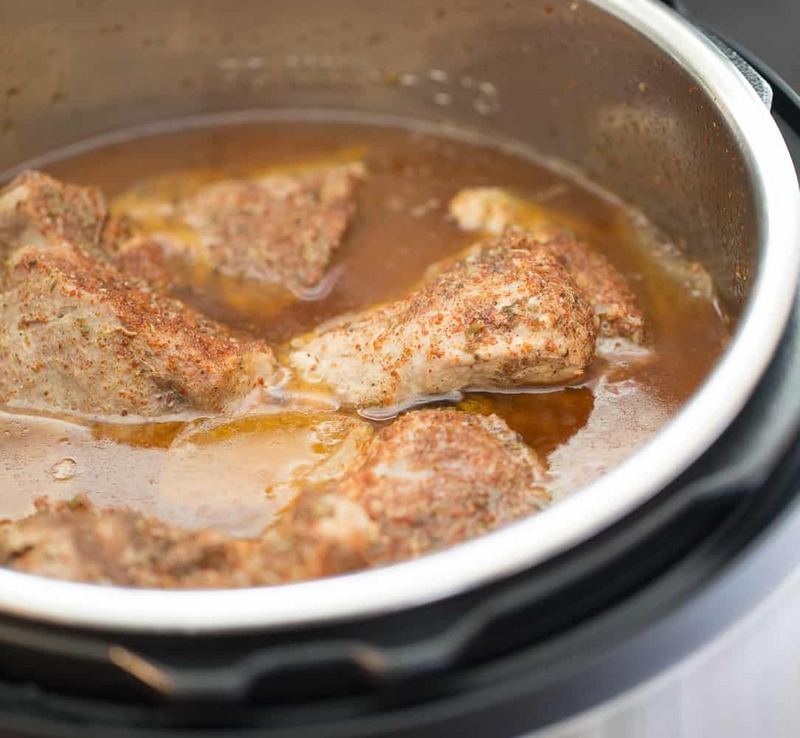 Place all ingredients into the Instant Pot and give them a quick stir to combine the spices with the liquid and to lightly coat the meat. Place the lid on the Instant Pot and turn it to lock it into place. Set the pressure release valve to Sealing, and press "Manual" or "Pressure Cook" ( depending on your model ). Set the timer for 45 minutes. Once the 45 minutes are up, leave the pot to do a Natural Pressure Release for 20 minutes. This means you should just let the pot sit with the keep warm function on ( it turns on automatically once the timer runs out ), for 20 minutes. 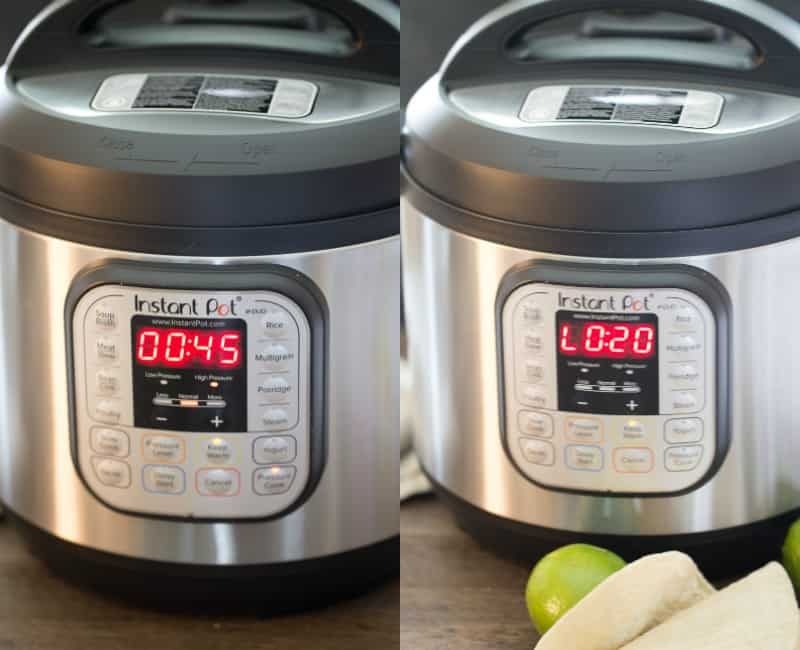 A timer will count up on the Instant Pot's display so you know how much time has passed. After 20 minutes, carefully release any remaining steam by turning the release valve to Venting, Cancel the "Keep Warm", and open the Instant Pot. Remove the bay leaves and discard them. Shred the meat with two forks directly in the pot. I like to let it rest for 20 minutes so the meat absorbs the cooking juices. You can also store the meat in this juice if you are going to serve it later. Before serving, place the shredded meat in chunks of shreds on a sheet pan with a lip that goes all around it, and broil it on high for 7 to 9 minutes to crisp it up.